Hard disk: A basic installation requires 18 MB of free space, to accommodate some 20 additional routes requires at least 400 MB free space? 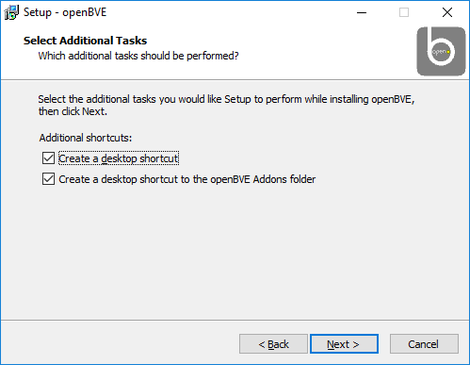 OpenBVE uses an add-on called OpenAL. 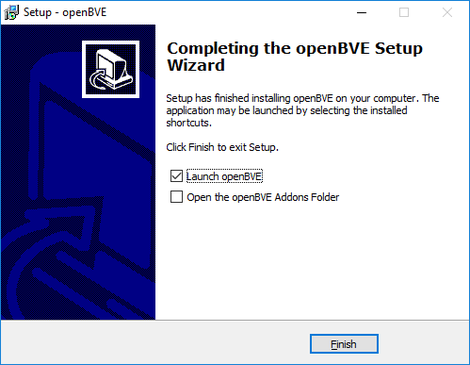 You need to download and install this add-on prior to using OpenBVE. Download the add-on from the official website of OpenAL. Select Downloads and then click at the text OpenAL 1.1 Windows Installer (zip) to start the download. Then click Save file in the dialogue box that appears. Depending on the configuration of your web browser, you may select where to save the file or it will, by default, go to the downloads directory. OpenBVE is available for download from OpenBVE Official Website. At the start page of that website, select Download ⇒ Download OpenBVE . Under the headline Windows (Installer) , click the blue button to start downloading the latest stable version. Then click Save file in the dialogue box that appears. Depending on the configuration of your web browser, you may select where to save the file or it will, by default, go to the downloads directory. The current version of OpenBVE is 1.5.3.3 when this is written. The file downloaded is named openBVE-1.5.3.3-setup.exe and has a size of 7 576 kb. The Uchibo line is a classical line in the BVE world. It comes with the original BVE software made by Takashi Kojima a.k.a. Mackoy. 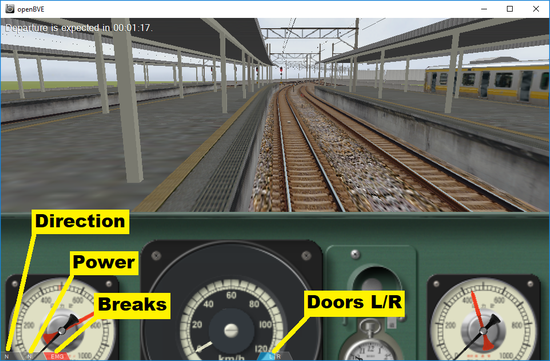 We need to add at least one route and a train to test OpenBVE after installation. You download the Uchibo line from this webpage at Mackoy’s website. Click the link uchibo10.zip to start the download. Depending on the configuration of your web browser, you may select where to save the file or it will, by default, go to the downloads directory. Go with a file browser to the directory to which you downloaded the file openAL Installer.zip . Extract the file oalinst.exe and double-click it to start the installation of OpenAL. The Windows UAC may prompt you if you want to run this file. Answer Yes to that. If you do not have administrator’s privileges, you need to type the administrator password for the computer. Picture 1: The user agreement screen of the OpenAL installer. Click the OK button, and the installation will begin. When the installation is done, a message box will appear to confirm that installation is done. Picture 2: The message box that confirms that the installation of OpenAL is done. Go with a file browser to the directory to which you downloaded the file openBVE-1.5.3.3-setup.exe . 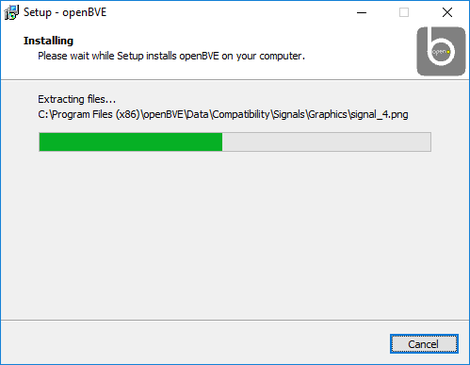 Double-click the file to start the installation of OpenBVE. A warning may appear, asking if you want to run the file. Click Run . Then the Windows UAC may prompt you if you want to run this file. Answer Yes to that. If you do not have administrator’s privileges, you need to type the administrator password for the computer. 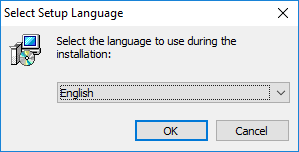 Then you may select language for the installation. The default value is English . Select the language you prefer and click the OK -button. Picture 3: The language selection dialogue box for the OpenBVE installation. The next dialogue asks where to install the OpenBVE software. The default value is C:\Program Files(x86)\openBVE . Click the Next -button to proceed. 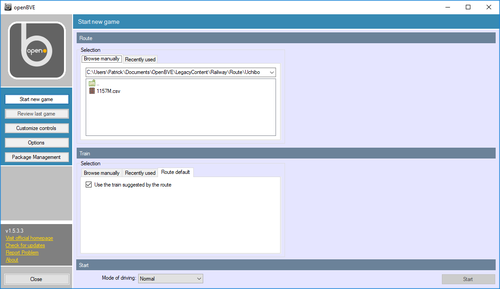 Picture 4: The dialogue window for selection of the path where to install OpenBVE. The next dialogue asks which start menu folder to create for OpenBVE. The default value is openBVE . Click the Next -button to proceed. Picture 5: The dialogue window for selection of which, if any, start menu folder to create. The next dialogue asks if you want to create additional shortcuts. 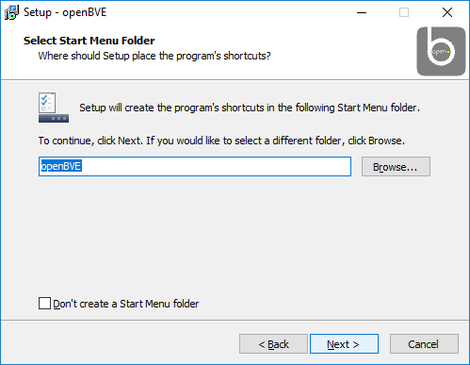 The default value is to create a desktop shortcut for OpenBVE and an additional shortcut for the OpenBVE add-ons directory. Select or unselect according to your preferences. Then click the Next -button to proceed. Picture 6: The dialogue window for selection of if to create additional shortcuts. The next dialogue asks where to store the add-ons for OpenBVE. Those addons are the routes and the trains that you later on will download and install to run in OpenBVE. It will make it easier later on if the location for the add-ons is a directory to which you have permissions to read and write files. Therefore, a subfolder to the user’s Documents - folder is a good selection. For the 1st alternative in the dialogue, Default , you may not access this directory with a file browser without having to switch on view of hidden folders. For the 2nd alternative in the dialogue, Program , you may not have write permissions unless you have administrator’s privileges of the computer. The 3rd alternative, Custom , allows you to select a subfolder to your Documents folder there you, by default, have all privileges necessary to add files manually. Select the alternative you prefer and click the Next -button to proceed. Picture 7: Selection of location to install OpenBVE add-ons. 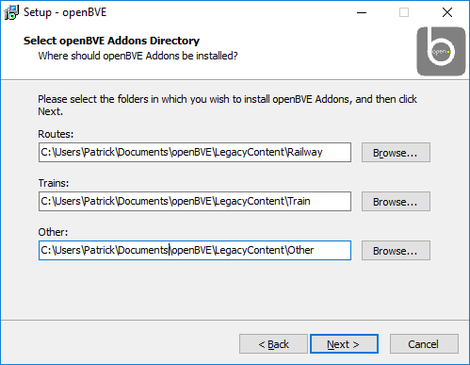 If you in the preceding step selected the Custom alternative for there to store OpenBVE add-ons, you may now specify the path on where to store routes, trains and other add-ons. To select locations under your Documents subfolder, specify the path C:\Users\Username\Documents\openBVE\LegacyContent\Railway for the routes, C:\Users\Username\Documents\openBVE\LegacyContent\Train for the trains, and finally C:\Users\Username\Documents\openBVE\LegacyContent\Other for the other add-ons. 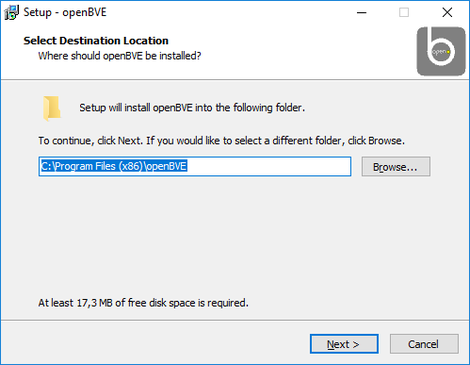 Replace Username in the path with the username you have on the computer to which you install OpenBVE. Picture 8: Example of customized paths where to store OpenBVE add-ons. 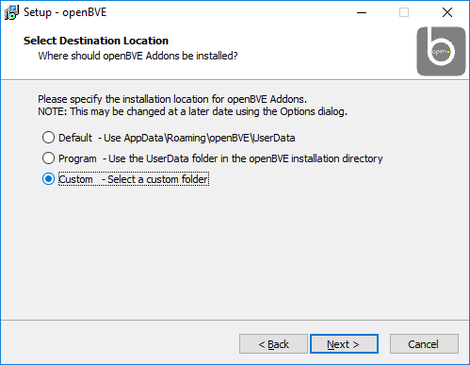 Now a window with the caption Ready to install will appear, listing some of the alternatives selected for the installation of OpenBVE. Picture 9: Window stating Ready to install . The installation takes place and a progress bar is shown. Picture 10: Progress bar during install. When the installation is completed, a message is shown. Click the Finish -button to start OpenBVE. Picture 11: Message of completed installation. 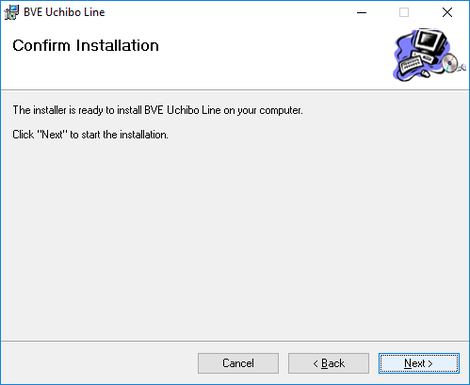 If the installation has been successful, the start window of OpenBVE will be shown. 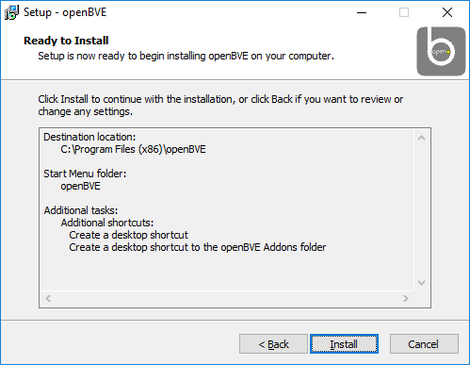 You are done with the installation of OpenBVE. However, we have no installed routes and trains, so to try OpenBVE out, the next step is to download and install a route with a train. Picture 12: The start windows of OpenBVE. The Uchibo line package contains a train, a JR class 113 EMU, and a route with graphic objects and sounds. This is installed to check that the installation works properly as well as because of that other routes may use some of the graphic objects installed with this route. Go to the directory to which you downloaded the file uchibo10.zip . Extract the file uchibo10.msi from the zip archive. Double-click the file uchibo10.msi to start the installation of the Uchibo line. 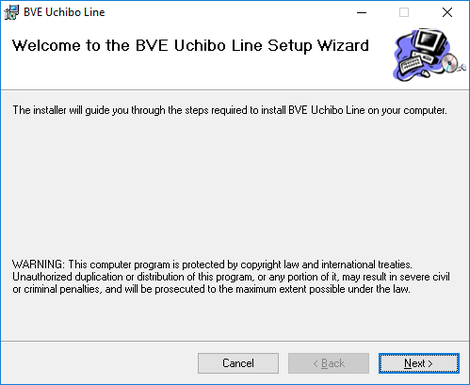 The first dialogue window that shows should have the headline Welcome to the BVE Uchibo Line Setup Wizard . Click the Next -button. 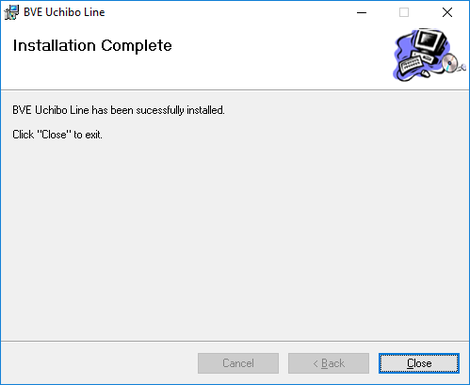 In next dialogue window with the headline Select installation folder you may tell at which location (path) you want to install the Uchibo line. You should enter the path to the OpenBVE LegacyContent directory. 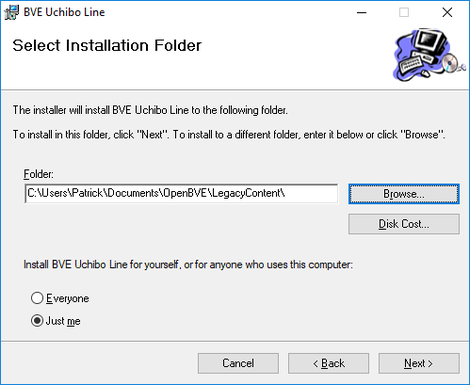 If you, while installing OpenBVE, selected to have your route and train data in your Documents directory, the path for installing the Uchibo line should be C:\Users\Username\Documents\OpenBVE\LegacyContect\ , where you replace Username with your own username on the computer. After ensuring that the install path is correct, click the Next -button. Picture 14: Enter the path to which you want to install the Uchibo line. Next dialogue window tells that installation will start if you click the Next button, do so. Installation begins. The Windows UAC may prompt you if you want to run this file. Answer Yes to that. If you do not have administrator’s privileges, you need to type the administrator password for the computer. When the installation is done, a dialogue window tells that. Now the main parts of the OpenBVE installation are completed. Next to do is a check that the program is correctly controlled from the keyboard. During the install, a start icon for OpenBVE is placed in the Windows Start menu (if you not opted to not create this). Use it to start OpenBVE if it is not already running. If the installation was successful, a dialogue window will appear for selection of route and train. 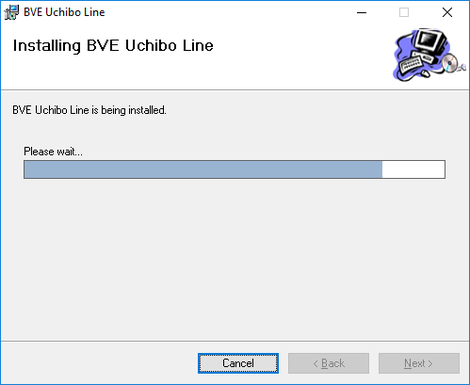 If you installed the Uchibo line in the Documents\OpenBVE\LegacyContent directory, go in the OpenBVE window to the field (not button) Start new game ⇒ Route ⇒ Selection ⇒ Browse manually and select the path C:\Users\Username\Documents\OpenBVE\LegacyContent\Railway\Route\Uchibo directory where you replace Username with your own username on the computer.. Select the default train for the Uchibo-line by, in the OpenBVE window go to Start new game ⇒ Train ⇒ Selection ⇒ Route default and check the box Use the train suggested by the route . Picture 18: Dialogue to select which route and train to drive. In the route selection field you will find one alternative for the >Uchibo line, which is named 1157M.csv . Click on the 1157M.csv text to mark it and then click the Start button in the bottom right corner. The direction indicator indicates N for neutral. Press the F key at the keyboard. The indicator should now indicate F for forward. Press the B key at the keyboard. The indicator should now indicate N again. The direction indicator indicates N . Press the B key at the keyboard again. The indicator should now indicate B for backwards. Press the F key at the keyboard. The indicator should now indicate N again. The power control indicator indicates N . Press the Z key at the keyboard several times and check that the driving control indicator steps up from P1 to P4 . Press the A key at the keyboard several times and check that the indicator steps down from P4 to P1 and then to N .
The brake indicator indicates EMG for Emergency Braking. Press the comma , key and check that the indicator steps down from B8 to B1 and then to N for none. Push the period . key at the keyboard several times and check that the indicator steps up from P1 to P8 . When checking the emergency brake, the brake indicator should indicate EMG when the / key is pressed at the keyboard. To exit, press the Esc key to get a menu of alternatives, including Quit . This section is extra reading. It is not necessary to know the structure of BVE directories and files to use the simulator. However, sooner or later, you may need this knowledge after downloading a route or a train for OpenBVE from Internet. Their install programs (if they exist at all) may not always produce the expected results. When such problems arise, the solution is often to manually move files to where they should be. There are two kinds of routes and trains distribution means for OpenBVE. The newest way of distributing such add-ons are in packages, so called managed content . The old, and so far still dominating, way to distribute routes and trains are in zip archives or with various software installers, so called legacy content . In OpenBVE, legacy content and managed content are stored in separate directories in the data directory of OpenBVE. Those subdirectories in the main OpenBVE data directory are named LegacyContent and ManagedContent . Here, the directory structure for legacy content is to be explained, because it is in this class of routes and trains files may be misplaced and/or need manual corrections. Picture 20: Example of directory structure for the OpenBVE legacy content directory with subdirectories. In this example, three routes (Uchibo, Nankai and NYCTA L) are installed and 3 train types (113, E218 and R143). This is a subdirectory to your main OpenBVE add-on directory, and has an absolute path such as C:\Users\Username\Ducuments\OpenBVE\LegacyContent . In it are 2 subdirectories: Railway (described in section 1.4.2.1.1 below) and Train (described in section 1.4.2.1.2 below), each of them with extensive contents. The directory BVE\Railway contains all data of the routes. There are three subdirectories: Object for graphic objects, Route for route definitions, and Sound for sounds. This directory contains subdirectories with graphic objects. Usually each route has its own subdirectory. A route definition is a text file containing a definition of the train’s route, which train to use and which graphic objects should be shown and their location relative to the train’s route. Also locations of sound objects are defined relative the train routes. Those are sounds not directly originating from the train driven, such as grade crossing bells, station announcements and various environmental sounds. Sometimes you want to be able to drive the same line but according to different timetables for local trains calling at every station or express trains calling only at major stations along the line. For each such alternative a separate route definition is made by the routes’ author(s). This directory contains subdirectories with sound files for the various routes. Usually each route or set of routes has its own subdirectory. In this subdirectory there are subdirectories for each train type and other kind of track vehicles installed in OpenBVE. These are only the trains that are supposed to be driven in a route. Those trains that you see in a route but not drive yourself are just graphic objects in that route. 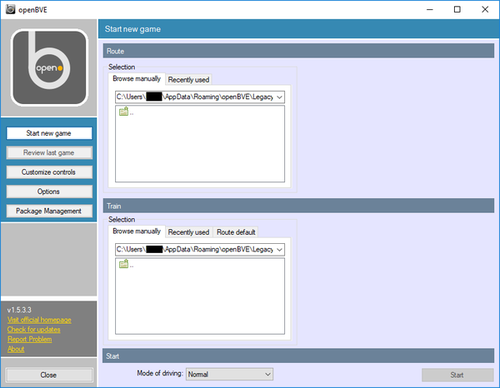 The subdirectory of each vehicle contains text files describing the vehicle’s performance and other properties, but also a definition of how the driver’s stand should look in the cab view of OpenBVE. There are also a lot of sound files containing sound of motors, brakes, door opening and closing etc. A number of bitmap images for the cab view are also found in the vehicle’s subdirectory.